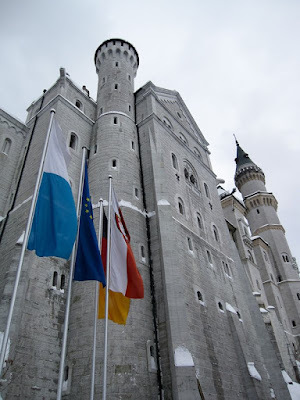 Sugar & Spice by Celeste: Day 6: Neuschwanstein Castle & Munich, Germany! Well, here we are at Day 6 of the journey. 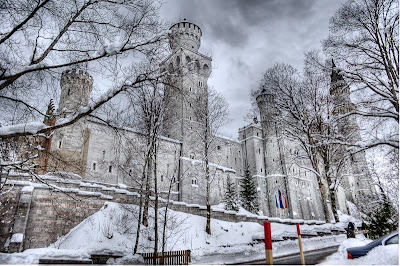 Our first destination of the day was the famous Neuschwanstein Castle. We woke up at 6am and got an early start. The drive was absolutely incredible! 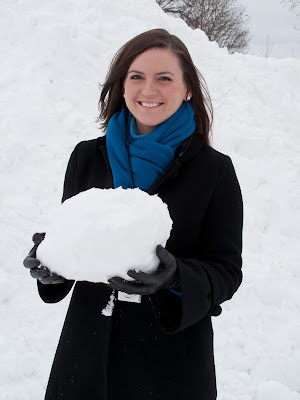 I've never seen that much snow in all my life...it was quite amazing. 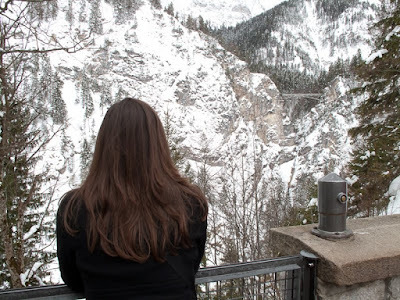 The Swiss Alps are truly breath-taking. We drove through several adorable little mountain towns on the way. 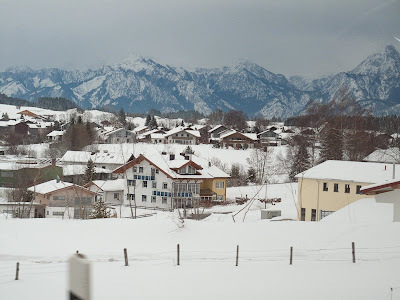 The cutest one was probably Garmisch. 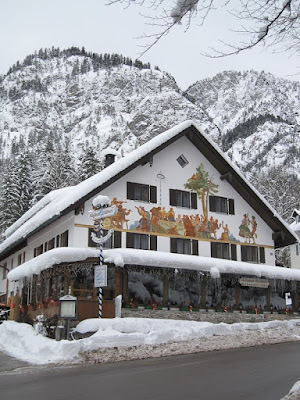 The German houses there were all painted with fairytale scenes right on the front of the building...like Hansel & Gretel. It was adorable. We saw a lot of people skiing up in the Swiss Alps too...it looked like a lot of fun, although I've never even attempted skiing...haha. 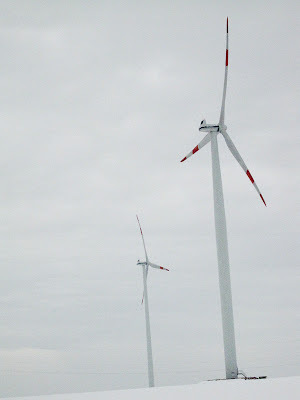 I loved these windmills...they were beautiful in the snow. 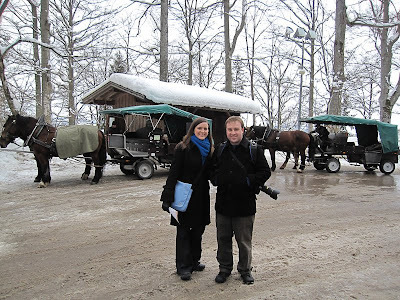 We took a horse-drawn carriage ride up the mountain...so fun! Once we made it to the castle, we were blown away. It truly is something from a fairytale. We rode in a horse-drawn carriage all the way up the mountain, so that just added to the fantasy of the day. This castle was actually the inspiration for the design of Cinderella's castle at Disney World. You really can see the similarities. The inside was just as pretty. 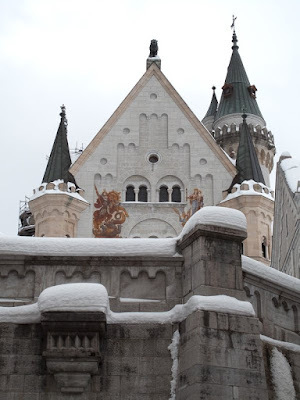 My favorite things were King Ludwig's elaborate bed and all the murals on the walls. The bed was made of dark wood and had amazingly ornate carvings in the wood....hand-carved, of course. The fabric was a wonderful turquoise color and the top of the bed had gold stars...it would almost be like falling asleep under the stars. The wall murals were also beautiful. King Ludwig was a huge fan of the famous composer Wagner, and all the paintings depicted scenes from Wagner's plays. For example, scenes from Tristan & Isolde were painted in the bedroom...which is a tragic love story similar to Romeo & Juliet. They wouldn't allow photos inside the castle...so, we could only get shots of the exterior. 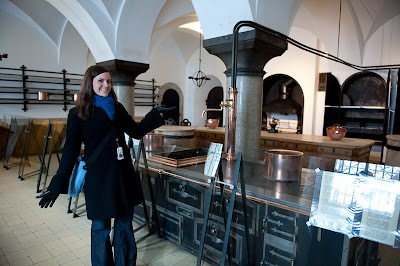 Now, you didn't think I could go through the castle kitchen without a photo, did you? 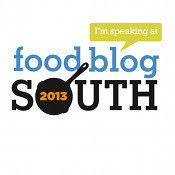 One day, I'll have a kitchen this fabulous...haha. 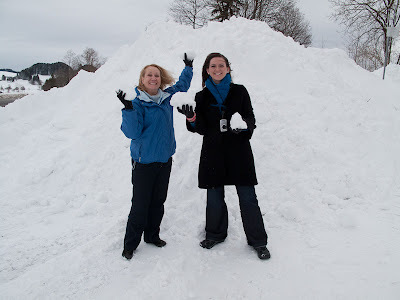 When we were finished at the castle, we drove all the way to Munich! 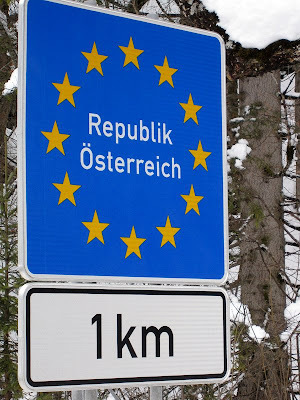 On the way, we actually drove through Austria for a bit, so we can add that to our "Countries Visited" list! 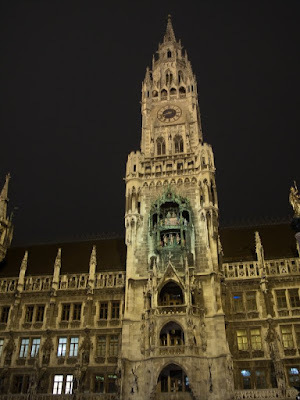 Munich is such a fantastic city!!! It reminded me a little bit of Paris. 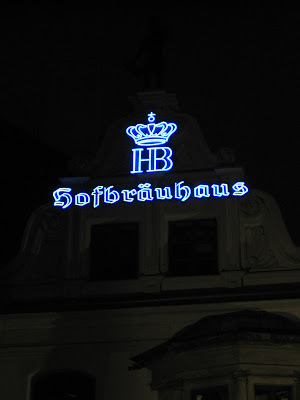 We ate dinner at the legendary Hofbrauhaus...it was delicious! Brad and I both ordered the "Original Hofbrauhaus Braumiestersteak: vom Schwein mit gedunsteten Zwiebeln und uberbackenen Millirahmerdapfeln." 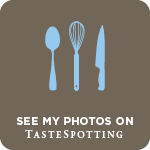 - Wow...I had no idea what this menu said! The food was amazing, though! 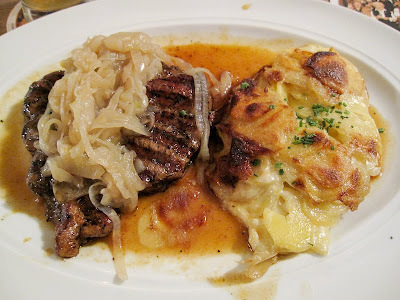 It was basically a tender pork steak with onions and sauce drizzled over the top and au gratin potatoes...Mmm! Their beer was DELISH. Brad ordered a ginormous mug of beer...it was huge...haha. 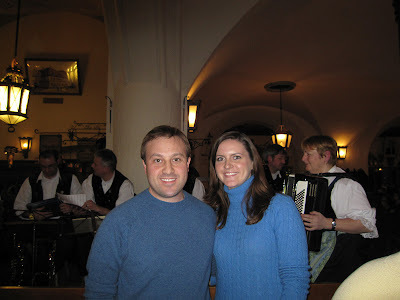 There was a polka band playing in the center of the restaurant. The atmosphere was so cool, and it's SUCH a fun place! 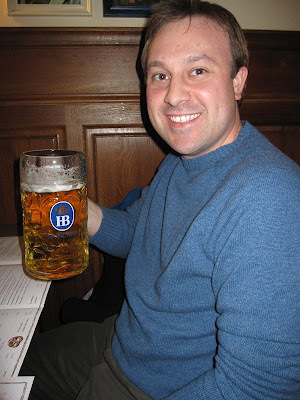 At almost every table, big groups of people were toasting each other with their HUGE mugs of beer. 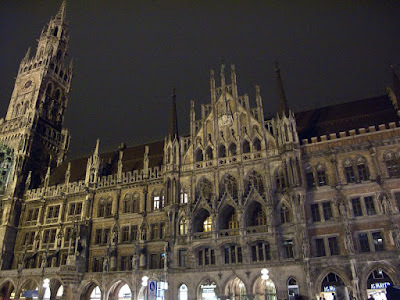 After dinner, we headed out and walked the streets of Munich...there are some fabulous stores. I could spend an entire day just shopping and looking at the elaborate store windows. There was everything from Christian Dior to Jimmy Choo....wow! Kit walked us around and was our official tour guide of the evening...hah. He taught us a lot about the history of the city. After all that walking around, we made it back to the car so that we could start our 5 hour drive home. We didn't get home until about 1:30am, but we had a blast! Another day of exploring castles was coming our way!